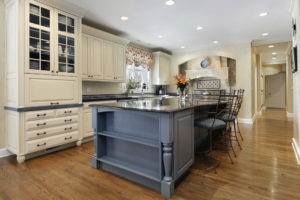 Adding an island to your space will give your kitchen a whole new look. They are an affordable way to add storage and a luxurious feel to your kitchen. We have come up with 5 benefits why our clients will love having one installed. Are you lacking cabinet space? Adding an island to your kitchen can fix that! It is a great way to add storage to your kitchen, or even an extra garbage to your layout. You will not regret having the extra cabinets. For those who don’t have a lot of counter space, an island will give you more surface to work on. Choosing to install a butcher block countertop will give it that extra flare. We have found that larger kitchens tend to have extra space. Our designers always say, each room in the house needs to flow properly, but at times, some walkways can be a little large and need something to fill the empty gap. Putting an island in your kitchen will do just so. Families love to gather around the kitchen. 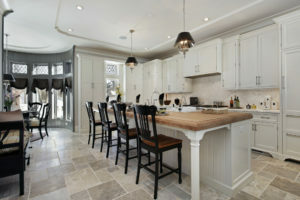 If your kitchen allows, add a few stools under an island to create an area where people will want to come and sit. Ready for a quick update to your kitchen? Installing a pot rack above the new island will not only give you more room for your pots, and easy access, but it will add a new feel to your chef style kitchen.